I have been bugging my friend Sarah Bessey to write a post for me for about a year. She has one of the strongest and most beautiful writing voices that I know. Plus, she is Canadian so many of her words have a surprise "u" in them. 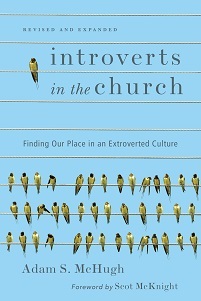 Since it is the last month of Introverted Church, I finally convinced her to write a post. I said she could write about anything she wanted, and I am honored that she chose to include some reflections on my book. Sarah writes at www.sarahbessey.com, where she has become a voice for women in the Church on issues ranging from mothering to politics and theology. She also works with Mercy Ministries of Canada, a non-profit residential home for women seeking freedom from life-controlling issues. Sarah lives in Abbotsford, British Columbia, Canada with her husband, Brian, and their three tinies: Anne, Joseph and Evelynn Joan. There were a lot of aspects of Adam's book that made me feel, I don't know, less alone. I've wondered, am I not spiritual because I'm not extroverted? if people wear me out so much, does that mean I don't love them? why do I need so much alone time? why does it take me two or three days to talk through conflict? why do I spiral in and out of community? why do I need to process everything alone and internally before sharing my thoughts, even with those I love best? 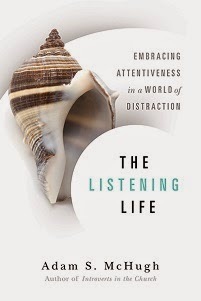 My husband had a good laugh when I read a few snippets of Chapter 5 out loud to him: "When introverts are in conflict...it may require a map in order to follow all the silences, nonverbal cues and passive aggressive behaviours!" But, in Adam's chapter on introverted spirituality, I felt my soul exhale. Because my own spiritual disciplines were reflected back at me, and it felt affirming. I've been called a prolific blogger. (Why does that never feel like a compliment?) As life has become more complex and busy over those years - I've had three babies in a little over four years, we've moved a few times, I've cycled in and out of working in marketing for credit unions and non-profits, my husband in graduate school and working full time, now I'm trying to write a book - people just couldn't understand why I was still writing every.single.day. How did I have time or energy for this kind of output? Granted, not all of it is worthwhile, but I write, almost every single day, and I've been doing that for years. The answer is simple: I have to write. I have to figure out what I think about my life and I can't do it without writing. I don't know what I think until I write it out. Writing has given me permission to contemplate my life in a daily rhythm, looking for the touches and movement of God across the day. I couldn't explain it, but I needed to take the time to process through my life and even the world's demands, it became a rhythm of my day, almost a spiritual discipline, to retreat and marvel and notice and struggle. I need to figure out what I believe and why, I need to figure out God, life, love, and I do that by reading and by writing, not by talking. Cue: underlining, scrawling "Amen!" in the margins. Okay, so I did a lot of that. Part of my spiritual discipline of writing is the act of writing itself, the self-discovery, the tracing of God in my own life and questions and doubts and struggles. But the other part of my writing life is that I feel connected by this work. I feel like it is one of the few things I have to give to the world. Blogging has changed my life, my spirituality, my opinions, my relationships, my heart, my mind, and I make no apologies for that (even if "blogging" is an excessively ugly word.) God has used this medium to profoundly change me, yes, but somehow, weirdly, he's also managed to include a few other people in that, and now I feel like I'm part of a bigger story. Here’s my own life, I’m determined to share it, to pour it out unfinished, imperfect. My fellow Canadian, Leonard Cohen wrote "there is a crack in everything, that’s how the light gets in." Sometimes I also think it’s how the light gets out. And sometimes the sharing of my life, especially the tender and still bruised parts of it, the parts without answers or neat bows of seven steps to whatever-it-is, is as much an offering to God as I can imagine, it’s sometimes the only way I know how to pray and worship. I gather my thoughts to write or talk or confess and all I can think is: I need to notice. I need to see. I need to call out what I need to feel, what I need to think, what I need to see about how God works and moves and breathes in the world. I need, I need, I need it all, too much (and I also need someone to vacuum the stairs). Sometimes I only find God as I’m writing and other times I only find Him in the lives of others, and sometimes it’s in the middle of the night when I’m so so so tired and then suddenly He blazes out of my entire life and the world and I can hardly breathe for the beauty in the pain and His faithfulness, His Love, the light through the cracks and it’s coming in and going out and I am dazzled. So yes, I share my life for the spiritual discipline of community and noticing it, for the love and passion I have for the world, for the beloved people of God, the broken and beautiful Bride of Christ, for my tinies, for my husband, for my own soul’s health, for you, and because I see God in my own words, just a little better, a little clearer, the light gets a bit brighter every time, for me. Hospitality for Those Who Would Rather Stay "In"